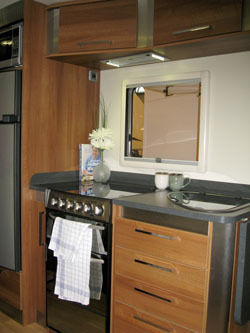 The Inos single axle caravan with a slide-out side is made by the North Wales based, Fifth Wheel Company. It made its first public appearance late in 2012. 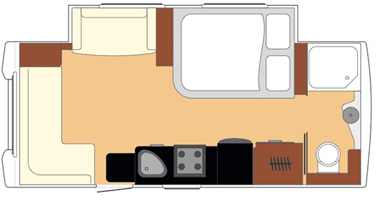 Handmade and built to order around a standard floor plan, Inos brings high-end high street and a domestic interior design palate to a new level in caravanning. Inos is a wood free body construction technique; wood is replaced by polyurethane Styrofoam panels and uses a four element sandwich construction method, which has good insulation properties. Heating is by convection using the Alde wet central heating system combined with under floor heating. The water system is top-end too, using the Whale water system with a triple insulated on-board tank. The kitchen is designed to be used and enjoyed; it has a fridge freezer, a 800W microwave, a triangular stainless steel sink, a four burner gas hob with oven and grill and an extractor fan. With a drawer stack featuring self-close drawers, dedicated storage for the freestanding dining table and generously sized overhead lockers, there’s more than adequate space for utensils and crockery. 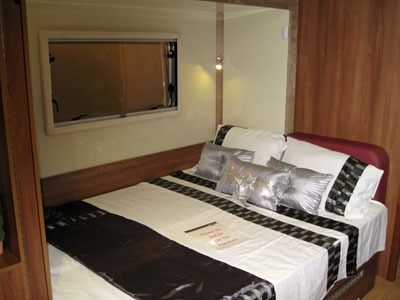 The slide-out section runs almost the entire length of the caravan and gives an extra 14 sq metres of living space. It’s electrically operated (12V) with a double seal and gives extra space in the living area allowing for more seating space. 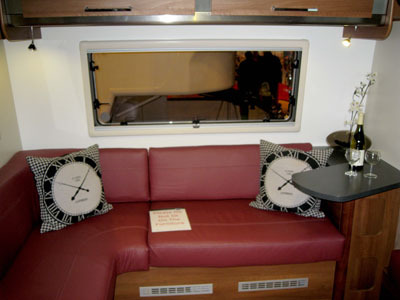 Storage space is not lacking here either as there is space under one of the sofas and spacious overhead lockers. The model we saw had an L shape seating arrangement making it possible for junior family members to sleep on the sofas. On site, the king-size bed glides into the slide-out and because of the extra internal width created the corner radius is reduced. There is storage under the bed, accessed by lifting the bed up. A solid domestic style sliding door leads into the shower room situated at the rear of the Inos. We liked the non-slip safety lino on the shower tray and the bi-fold door is space saving; not that space is at a premium in this unit. The Alde header tank does take up space but that aside, there is plenty of storage for a goodly variety of toiletries including in the cupboard under the semi-recessed basin. Fabrics are largely the customers own choice and need to blend with the interior wood furniture. Lockers were previously sourced in Italy but the wood is sourced in the UK not far from the factory, thus improving the company’s carbon footprint. Lighting throughout is LED – a mix of warm white and cool white – which help its green credentials too. High security locks are fitted to all the doors and Inos is built on a BPW chassis with BPW IDC Anti-Snake trailer control system and Winterhoff 3000kg stabiliser. Extra security such as an alarm is optional. 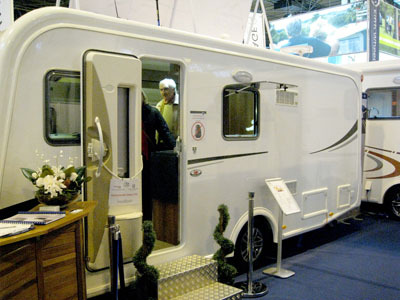 Bear in mind as the caravan retails at £36,000 it is very likely you’ll need to buy a tracking device to satisfy the requirements of your caravan insurer (make sure you invest in a system that is insurance approved). The awning rail is according to the customer’s specification. Verdict: it’s a unit to aspire to for some, a must-have purchase for others and some may overlook the design principles altogether. 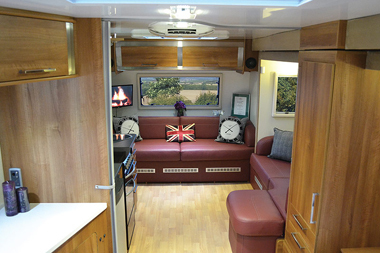 Taking the middle road, we think it has its place within the industry and is a long-term lifestyle investment, ideal for a couple or a family that can take time out to tour the UK or abroad for extended periods or to put on a seasonal pitch. It would be wise to check with site owners that a unit this size could be accommodated and allow the necessary space for manoeuvring. The BPW iDC anti-snaking system will lower your insurance premium with a safety device discount. *Caravan insurance cost based on model fitted with an axle wheel lock, hitchlock, plus Caravan Guard approved tracking device. Kept on drive at HX4 0BE. Caravanners over 30 years old, claim free for 3 years and a member of a caravanning club. £100 excess. 180 days European cover and up to £75 per day for up to 15 days emergency accommodation cover included. Legal expenses cover, extended European cover and other emergency accommodation expenses cover options are available at extra cost. Quote includes 10% online discount and 6% Insurance Premium Tax and is correct as of May 2013. **Price is ex-works, includes VAT at 20%, but excludes delivery, installation and any other costs as determined by the manufacturer, distributor, dealer or park owner. Please check the price carefully before you buy as it can vary considerably dependent on many factors including the geographical location of your chosen park. Looks good, The extra space it creates will no doubt add to the comfort . However, I am not ready to change from my new trailer camper/trailer tent at the moment.